For most actors, losing weight is the ultimate sign of character commitment. Christian Bale’s weight plummeted for The Machinist; Tom Hanks cut carbs for Cast Away; even 50 Cent dropped a serious amount of pounds for Things Fall Apart. 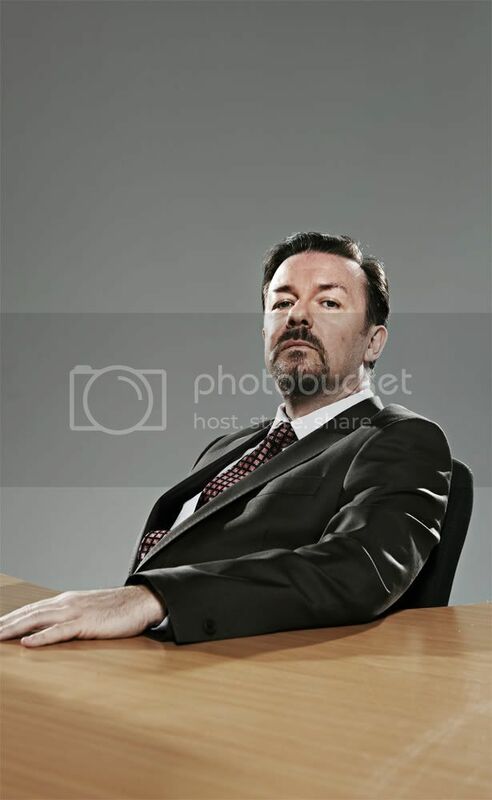 Ricky Gervais, however, went one better than all of them for his own career-defining turn. He lost height. He bends his knees, hunches his back and thrusts his stomach out. Instinctively, his front teeth grip his bottom and his index fingers extend to form flesh pistols. Despite the fact he’s already sporting a goatee beard and an ill fitting suit, it’s only now — slightly smaller and oozing smugness — that he truly is David Brent. At this stage, we should point out that the 50-year-old comedian is not in the self-satisfied habit of wandering around Hackney dressed as Slough’s favourite creation. The beard and suit have been grown and donned respectively for ShortList’s exclusive photoshoot to celebrate The Office’s 10th birthday. When it first aired on BBC Two in the smallest hours of 9 July 2001, the show was met with little fanfare. One reviewer, Gervais reminds us, even branded it “a summer stinker”. So, Ricky, how does it feel to ‘be Brent’ again? It feels good — although I left the goatee until the last minute. I get recognised more when I’ve got it — it’s like people need that visual aid to work out where they know me from. How does he measure up to the characters you’ve played since? None have been as much fun to play. People say that he was a b*stard and ‘The Boss From Hell’, but he really wasn’t. He was just a twit. He was a man whose biggest mistake was confusing popularity with respect. What made him so fun to play? He’s the idiot, and stupidity is always funny. Stupidity mixed with arrogance may even be the pinnacle of comedy. It’s David Brent, it’s Homer Simpson — even Karl Pilkington is at his funniest when his stupidity is mixed with a bit of arrogance. If you’d met Karl before you made The Office, would you have put him in it? If I’d met Karl before I made The Office, I don’t think I would have done anything. Ever. I would have just sat in a room with him, letting him talk. You’ve often cited This Is Spinal Tap as a major inspiration for The Office — what were the other big influences? Laurel and Hardy. The Office is basically a room full of Laurels and one Hardy, which is Tim [Martin Freeman]. Tim’s character is common in comedy — that person who thinks they’re better than everyone else, but it doesn’t get them anywhere. Lisa Simpson, Woody Allen, Bob Hope — they’re all Tims. I suppose The Office is a comedy about comedy, really. It allowed me to get a lot off my chest about what ‘funny’ really is — the way people mistake jumping about and doing catchphrases for ‘a great sense of humour’. Do you regret leaving it at two series and a two-part Christmas special? No. I miss it and I couldn’t be prouder of it, but that third series… It might have been good. But it might not. So you never had any plans for a third? None. We didn’t even have plans for a second series after the first. We didn’t think we’d get one. The first series got the lowest ever BBC focus group score — joint bottom alongside women’s bowls. But we didn’t change a thing. We knew how good it was, but that doesn’t guarantee success on any level. There are loads of great things that get cancelled. For us, ‘success’ just meant getting our own way and having it turn out exactly as we wanted. How did you manage to get the freedom to make that happen? Incredible luck, mainly. It may still be unheard of in British TV to get left alone in the same way we did, as first-time directors. But also, we didn’t just pitch a script — we made a pilot and gave it to them. If we’d just sent off the script for the first episode, it would still be in a drawer somewhere in the BBC. I guarantee it. I mean, how do you describe David Brent in writing? “A man does a bad joke, touches his tie and looks at the camera.” Brilliant [laughs]. It doesn’t exactly jump off the page, does it? So, instead, we showed them what was essentially the first episode. And they were hooked. What happened once they’d seen it? They called me and Steve [Merchant, the show’s co-creator] in for a meeting. I walked straight in and said, “We’re going to write and direct it, I’m going to play the boss, and there’ll no be famous actors in it.” After we came out, Steve said to me, “Rick, in future, can I do the talking at these things?” [Laughs] Steve was terrified he’d end up living in his car after that meeting. But it worked because I wasn’t bluffing. I really could walk away if they didn’t do what we wanted. I was a bit of a critic — I’d watched telly for 30 years, saying, “I could do better than that.” Sooner or later, you’ve got to put your money where your mouth is. Do you think the success of The Office paved the way for other painfully realistic comedies, such as Peep Show? If I thought the show had changed comedy, I’d keep that to myself, because it would be arrogant to say so. But we were certainly different. I don’t think there was anything before that had been quite such a slave to realism. We threw out the jokes. If there were ever any jokes, they were bad jokes. There were long pauses, awkward silences. I remember deleting something from a script once because I thought it was too ‘traditional sitcom’ and one of the producers sarcastically said, “Heaven forbid.” I was like, “Yeah, heaven forbid — because I don’t want to make another sitcom like all the others.” Thinking back, as much as I enjoyed making The Office, I felt as if I was doing this [mimes fending someone off with a crucifix] the whole time. Is Brent based on a specific person? He’s based on a few. But Gareth [Mackenzie Crook] is based specifically on a bloke who I went to school with. I talk about him in my stand-up routines. He’s the one who said, “If you get captured by cannibals, they show you pornographic pictures so that you get an erection and there’s more meat.” I used tons of his gems for Gareth. Can you give us one that you didn’t use in the show? When we were about 14, he said to me, “If you’re in the SAS, you’re not allowed to tell anyone. Not your wife, not your mates, not your mum. No one.” I asked him, “How do you know?” And he just replied, “I’ve got loads of mates in the SAS.” [Laughs] That’s pure Gareth. Who was the most difficult to crack? When did you first realise how popular The Office had become? How do you think Brent stands up against the likes of Basil Fawlty and Del Boy in the British comedy canon? Again, I’m not allowed to say, and only time will tell. Fawlty has lasted 30-odd years. Ten years isn’t long enough to judge it, really. Do you think The Office will still be remembered as fondly in another 10 years? What do you think Brent would be doing in 2011? I don’t like to think about that, because we only wanted him to exist in the programme’s bubble. He might be OK...I’m pretty sure he’s gone back to a regular job and got all that ‘being famous’ stuff out of his system. I don’t think he ‘made it’ in the way he wanted to. Is he still with his blind date from the Christmas special? I don’t know… No, I don’t think so [laughs].She was about killing Brent off, though. She made him self-aware and as soon as he has awareness, he’s no longer the character. Once he tells Finchy to “F*ck off” and she tells him “Be yourself”, he’s done. We might as well have thrown him off a building — he was stone dead after that.